After an eternal winter, it seems like we've nosedived straight into summer which has been a little disconcerting because it's not natural (hello global warming) and also a little disappointing because it means I haven't been able to wear much of my transitional wardrobe which includes some of my favorite jackets and trench coats. Well there's nothing I can do about that so I've been looking at things I'd like to wear when it's hot. My face can never get enough sun protection and if I'm not using my UV umbrella, I'm all about a good stylish wide brimmed hat. The boho meets retro vibe of this breezy top is so appealing and it'll look equally cute paired with jeans, shorts or skirts. I always carry a scarf in my bag during the summer so I have something to throw over my shoulders wherever the air conditioning is cranked up to frigid. 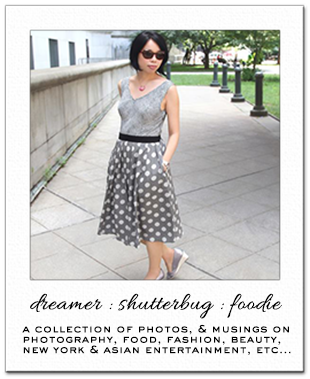 Loving the vintage chic styling of this one and it happens to be on sale! I'm really into the ease of culotte style pants and I can't believe I still don't have a pair in chambray yet. Charming and cheeky and the blush pink color is so pretty. Tiny sunglasses may be on trend now but I'm all about the coverage oversized sunnies. I'm such a fan of elegant and timeless jewelry like this. These embellished hoop earrings are such an effortless way to add sparkle to any outfit. Scallops are one of my favorite design details and this compact wallet is perfect for smaller purses. This cute and roomy tote looks ideal for summer. I want those pants. They look so comfortable. Oooo...those J Crew pants drew my attention right away, chingu! Great picks as always..there really are all great additions for the hot weather. I really like the bracelet, this is my kind of jewelry. I love oversized sunglasses too, the small ones look weird on me. I love that wide brim hat, I've recently read that every additional inch of a brim hat minimalism the risk of skin cancer significantly. I'm all in when it comes to wide brim straw hats, I even plan to write a whole post about why I love them so much. I have quite a few of them, they can cost practically nothing and they can look so stylish! The second blouse is so beautiful and romantic. That scarf looks wonderful and I also like to carry a scarf in my bag. They are light and they can often come in handy. Those cropped wide pants look so stylish. I really like the sunnies, the bracelets, the shoes and the bag as well. Excellent choices! Have a great day! So hard to pick just one they entire selection rocks have a lovely weekend. Nice list Rowena! Love the square neck top and cute sunglasses! I noticed the small sunglasses trend, but I'm all about oversized sunglasses too! Have a great weekend! I love a good hat and really need to upgrade mine. I never thought I'd like culottes but they're growing on me. A chambray pair sounds great! I know very frustrating that there is no transitional weather any more and yes scary. Wow all these items together would be a great outfit! And that tassel bag is gorgeous looks too expensive for H&M. I love every single piece and... I can't wait for summer! Oooh I love the cushion and the espadrilles in particular - I would love to decorate my house with items like the former, and need the latter for when I go to live in Spain for three months lol. I really like the boho top! 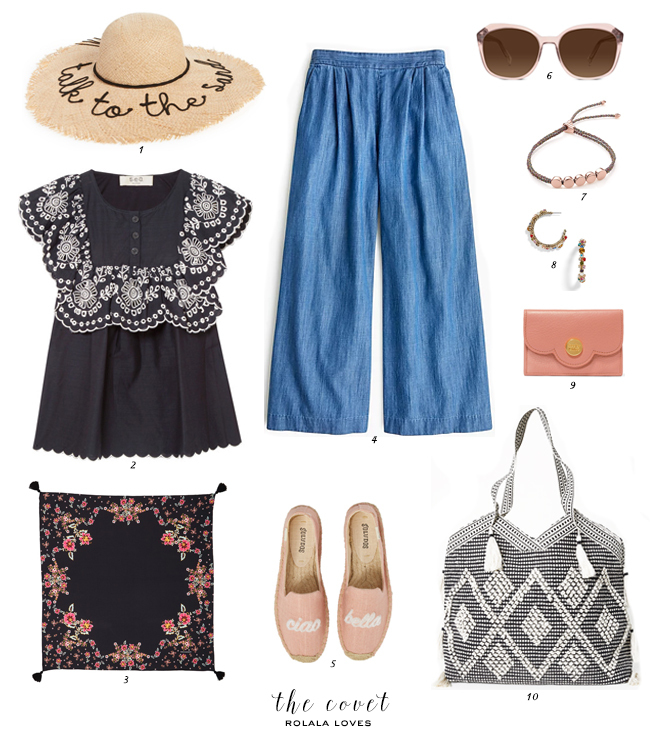 These are all beautiful pieces; I’m loving the straw hat and chambray pant.